Degenerative disc disease is a painful condition that causes recurring discomfort and interferences in nerve function. It occurs when the soft, spring-like discs of the spine begin to wear down, losing their ability to absorb shock. 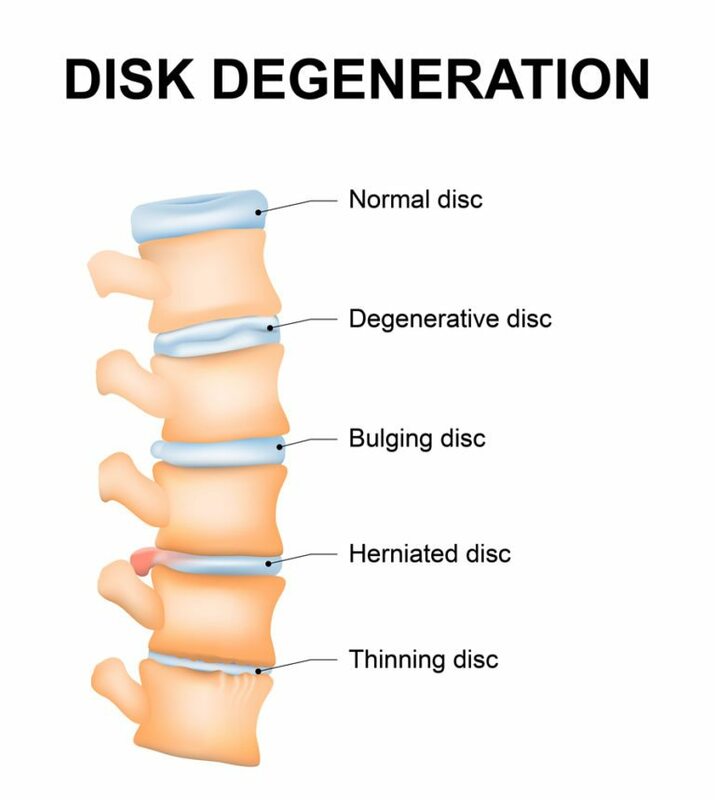 Although it is a normal condition associated with age, degenerative disc disease can be debilitating for some patients. Ranging from mild to severe, symptoms may include tingling or pain in the shoulders, back, buttock and extremities. Pain may worsen when sitting or bending, and it may also come and go periodically rather than chronically. Over time, the condition may progress, causing additional inflammation, pain, and muscle spasms. Degenerative disc disease is often isolated to the lower back and the neck regions, although it can affect the entire spine. It may cause back pains. that degenerative disc disease is thought to affect approximately 12 million adults in America? It is caused by a loss of fluid within the discs responsible for pressure absorption. Although degenerative disc disease is usually age-related, the condition may also be caused by car accident injuries and other incidents that result in tears or cracks in the disc. If you are experiencing any of the symptoms of degenerative disc disease, see a Dr. Peelle for a diagnosis. An x-ray, MRI, or myelogram may be necessary to confirm that disc degeneration is the cause of your discomfort. What types of degenerative disc disease treatments are available? There is no cure for degenerative disc disease, and the condition cannot be reversed. However, there are treatments available to help manage pain and other symptoms. The use of a lumbar support brace and physical therapy are easy, non-invasive ways of managing pain. However, many patients require additional interventions, such as epidural steroid injections to provide several weeks or months of pain relief. Dr. Peelle will discuss your treatment options, which will be dependent on your age, overall health, and the extent of your degenerative disc disease and symptoms. Is there anything I can do to help improve the pain caused by degenerative disc disease? You should follow all instructions for treatment exactly as prescribed by Dr. Peelle. However, you may also be able to alleviate symptoms and improve your long-term outcome by maintaining a healthy weight and learning postural control. Dr. Peelle may also recommend the use of muscle relaxants or pain medications to help manage symptoms.